It feels like I have gone through a massive glut of books this year. Just can’t get enough of ’em. Even on the short flight back from Denver (after leaving Las Vegas… lights so bright, palm sweat on a Saturday night…) I felt the urge to pick up something a bit better than just a magazine. Mind you, I did pick up an issue of Real Simple magazine as well, but I digress. Lately I have been back on my “information binges”, so I think the reading of everything I can get my hands on is part of that. 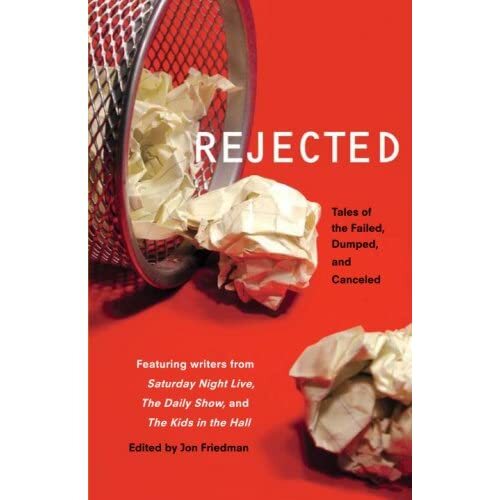 The book I picked up in the airport was Rejected: Tales of the Failed, Dumped and Canceled by Jon Friedman. It’s an easy read, as it’s basically a collection of short stories and articles written by mostly comedic writers and actors, or rejected content from said writers and actors. Some of the writers have been associated with The Daily Show, SNL, and Flight of the Conchords, to name a few. It’s a nice little collection. There’s a few duds, but most of the pieces are funny and quick-witted, though somewhat understandable as to why they were “rejected” (too racy, too risque, too esoteric or just not funny enough). Lots of laugh out loud moments so far (I admit, I haven’t had the chance to finish it). Plus, one nice thing about it is that most of the writers are very successful folks, so it gives hope for the rest of us, in a humorous way. A nice light summer read for anyone who’s interested in picking it up. Sam’s verdict on a scale of ‘how late into the night I’ll stay up reading it despite how tired I am’? It’s a 1 am novel. You keep wanting to read the next story, but at the same time, it’s easy to put down too. sounds good. I’m on a info binge too, but unfortunately all a lot drier than that one! Have to read “must win battles” tonite before work tomorrow-guess I should have started a bit sooner!